A garden is a place to relax, unwind, entertain and play. A place to reconnect with nature, showcase your love of the environment, or grow your grandmother's heirloom tomatoes and roses. A landscape should be an extension of your home's elegance, provide a safe place for your children to play and learn to appreciate nature. Think movie nights, picnics, client presentations, staff meetings, a reading nook...uniquely representative of you, or your business. Now, imagine a group of dedicated, professional horticulturists, passionate about their craft and skilled at making those dreams come true…that’s Blossoming Beginnings. 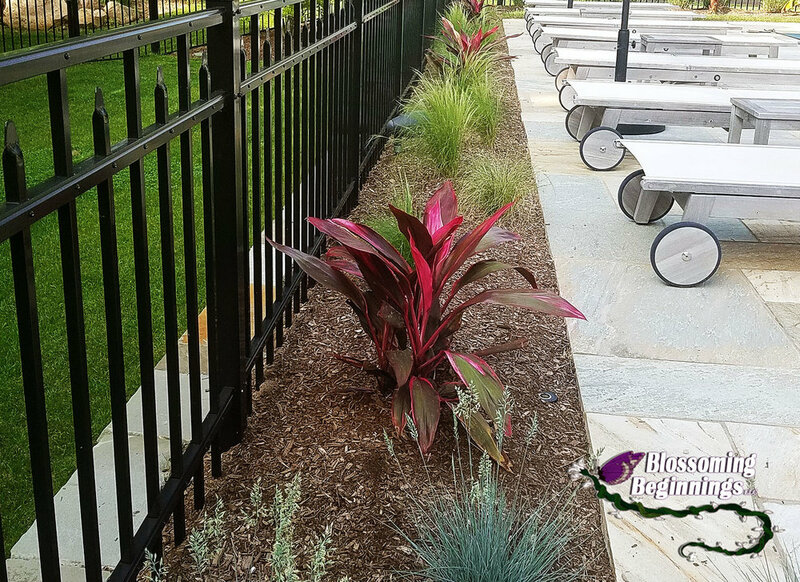 At Blossoming Beginnings, we strive to craft your vision into a beautiful landscape design which is both visually pleasing and functional. Creating inspired landscapes is the driving force behind our success...and yours. 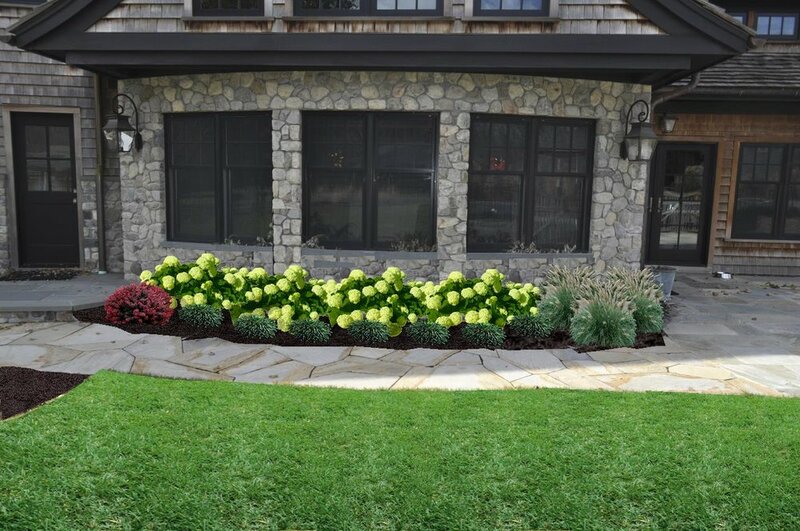 We offer commercial and residential landscape design services throughout Bergen County, NJ. Photography by Arthur L. Crank Jr..
We know it can be tough to envision the end project so all landscape design packages feature custom 3D design images so you can see what we see! Better than a sketch, we can show you what your mature garden will look like in 3-5 years and incorporate landscape design hardscaping like paths, patios, walls and pavers. Better than a sketch and easier to read than a blueprint! Residential landscape design by Blossoming Beginnings. Front yard landscape design by Blossoming Beginnings. A few of our favorite client projects are listed below. Every design is a journey. Contact us so you can begin yours today! Pool landscape design is a specialization. Design concepts require attention to detail and plant knowledge since you need plants that will thrive in full sun, provide color without looking washed out, require minimal maintenance and not attract bees. 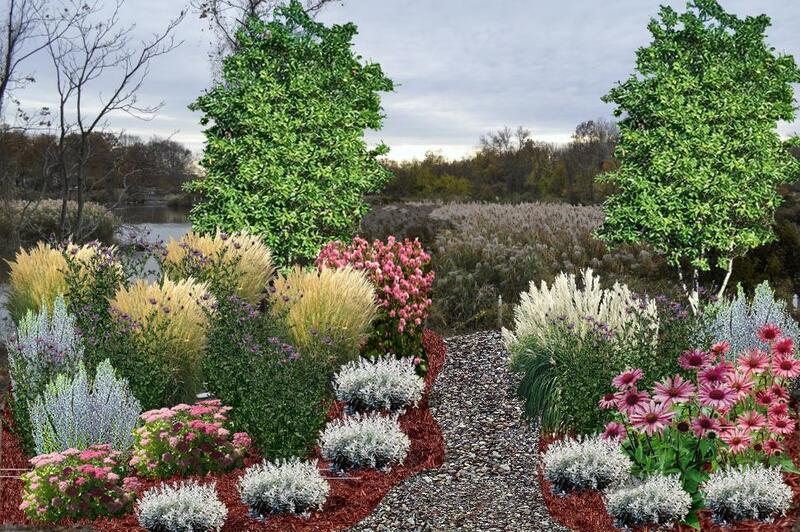 For this design, we used a combination or deciduous shrubs, succulents, tropical plants and ornamental grasses. A simple, sophisticated palette that is both eye catching and lush which enlivens the landscape, softens the hardscaping and complements the water. Grasses are a great choice because they create movement and catch the eye as they blow in the breeze. Featured plants include: Red Banana trees, Mexican Feather Grass, Fountain Grass, Mondo Grass, Blue Fescues, Pygmy Barberry and Hydrangea Paniculata shrubs, Blue Agave and Cordylines. Pool landscape design by Blossoming Beginnings. Featuring shrubs, ornamental grasses and tropical plants. Featuring: Barberry, Blue Fescue grass, Cordyline and Mexican Feather grass. Cordylines and Mexican Feather grasses. Commercial curb appeal, you either have it, or you don't. If your landscape isn't turning heads, beckoning clients to your front door and distinguishing you from the competition, you're operating at a disadvantage. That disadvantage can equate to lost revenue. 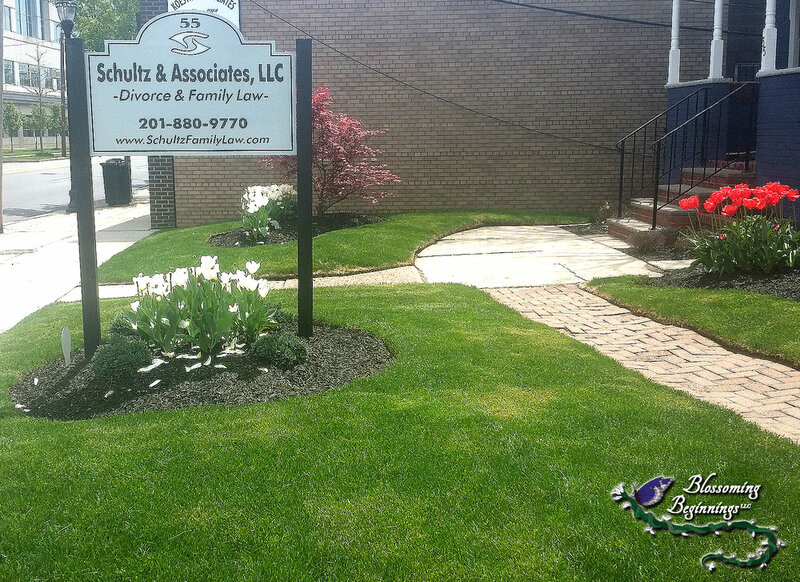 Schultz & Associates, located in Hackensack NJ, understands the difference so after their building underwent extensive renovations, they contacted us for a landscape design makeover that would increase their curb appeal and property investment. The result was classical garden elegance with three season curb appeal. Design images include pre installation and one year later. All garden beds were amended with compost during the installation resulting in a healthy, vigorous garden. Bulbs and seasonal annuals complete the show for non stop color. Curves were added to enliven the small space and a pristine lawn provided a restful expanse of green. Low maintenance plantings include: Steeds Holly, Boxwoods, Hydrangeas, Colorado Blue Spruce, Japanese Maple, Blue Fescue, Ferns, Irises and Hosta. Side view of Schultz Associates after landscape installation. Landscape design by Blossoming Beginnings. 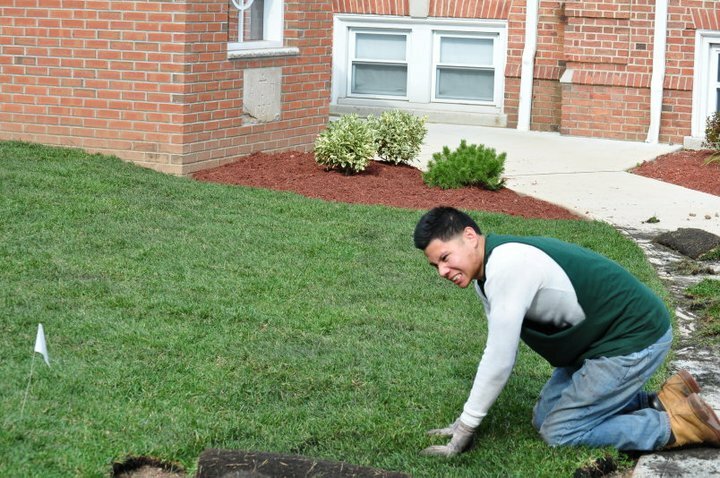 Blossoming Beginnings provides commercial landscape design services in Bergen county, NJ. Spring Tulips bloom first year after landscape design installation. Hackensack, NJ. Design by Blossoming Beginnings. Red and white Tulips up the curb appeal of Schultz Associates, Hackensack, NJ. Design by Blossoming Beginnings. Annuals enhance your landscape design. Design by Blossoming Beginnings, Bergen County, NJ. Annuals in bloom in this front yard landscape makeover by Blossoming Beginnings. We were tasked with installing a sustainable landscape design for the 1st Passive Energy House located in NJ. Talk about gardens with a purpose! This garden is a testimony to the owner’s love of nature, featuring bee and bird pollinator plants and winter food sources. The owner's installed their own food garden as well as requesting boulders, a nod to their love of South Western garden design. The husband grew up with parents who loved conifers, but the wife was more appreciative of flowering perennials. To accommodate both tastes, we incorporated the Weeping White Pine featured in the main bed and the Bosnian Pine at in the entrance bed. The Bosnian Pine was a great choice because of the rich, dark green which contrasts vividly with the cream of the siding and it’s compact footprint which is perfect for a small bed. Black mulch was chosen to complement the trim on the house and is a perfect choice to make the myriad greens pop out and engage the eyes. Their front entrance offered a unique opportunity to implement a design in tiered beds, giving the garden a unique perspective and depth. It contains a variety of material to provide an interesting view and three season appeal. The Bosnian Pine, Dwarf Hinoki Cypress and Dwarf variegated Pieris will provide year round entrance without overwhelming the small space. The perennials will gradually grow in to provide a blanket of color at their feet. Shrubs and Perennials include: Dwarf Hydrangea, Helleri Holly, Salvia, Heuchera, Creeping Phlox, Rodgersia and Ajuga. A cottage garden is a thing of beauty, overflowing with blooms and colors. It is also *shudder* high maintenance. Especially a garden as lovely as this which includes a Wisteria arbor, Espaliered Pear Trees and Heirloom Rose hedges. Let it get out of hand and you have a mess on your hands. Flower bullies pushing out their neighbors and unwanted weeds mixing in with formerly lush foliage had ruined the picturesque nature of the garden. We chronicled existing plant varieties, removed overgrown and ailing plants/shrubs, then replaced them with masses of plants complementary to the overall design. 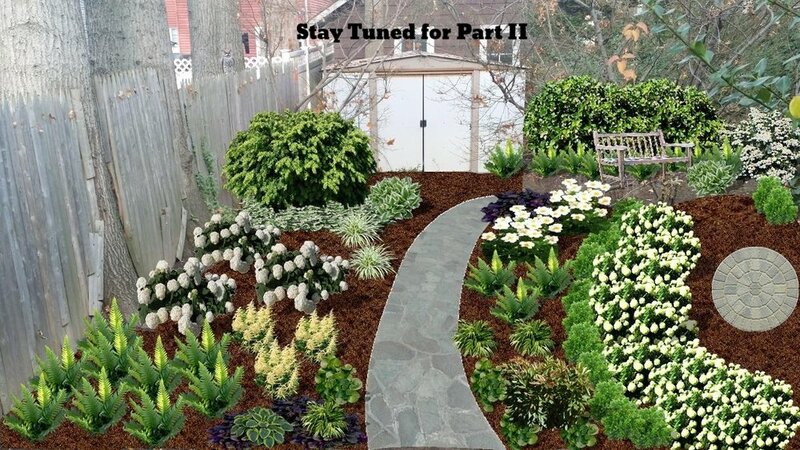 Joining the cast additions include: Pinky Winky Hydrangea Tree, Double Knockout Roses, Variegated Irises, Bluemist Shrub, Shasta Daisies, Karley Rose Fountain Grass, Gold Mound Spirea, Japanese Forest Grass and Rainbow Fetterbush, to name a few. This garden design features shade tolerant plants and shrubs. The client wanted a no lawn, low maintenance planting with diverse perennials and shrubs for 3 season appeal. Featuring: Carex grasses, Solomon’s Seal, Ferns, Goatsbeard, Astilbe, Hydrangeas, Irises, Wild Ginger, Boxwood, Bubblegum Rhododendron, Japanese Ferns, Virginia Bluebells, Deutzia and Hostas. 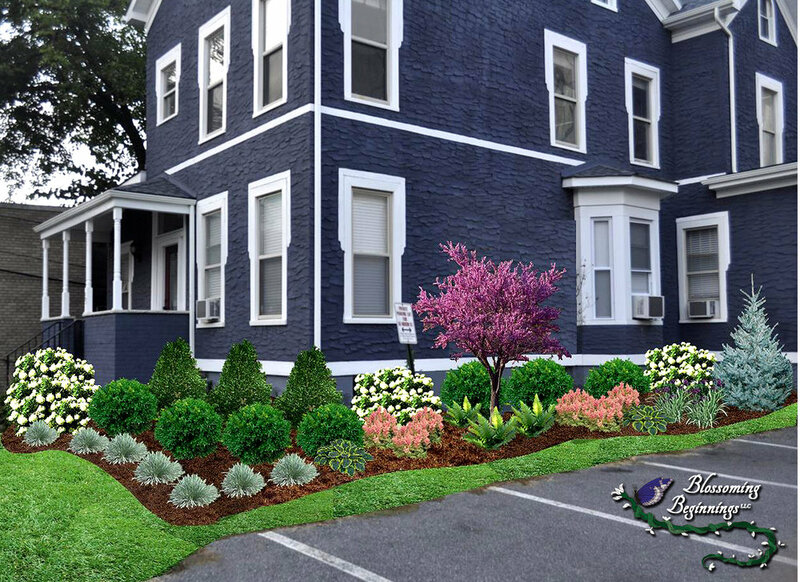 Curbside planting is Periwinkle. Spring blooming bulbs were added in the Fall, White Daffodils, Pink and white Tulips and Crocuses to extend garden appeal and highlight the Pink Dogwood tree. We install all our gardens with love and encourage our clients to make the garden their own by adding personal art. This client went the extra mile by adding custom engraved artwork featuring her favorite poetry and memorial plaques to her pets. Her garden has become a mainstay of the neighborhood and folks stop by to see it all the time. Here is one of our unique commercial landscape designs featuring a labyrinth for Trinity Episcopal church located in Cliffside Park, NJ. The beauty of the Labyrinth lies in it’s origins tracing back 4,000 years, appearing throughout the world in various forms and myriad cultures. The circuit of the labyrinth, or pathways, represents man’s spiritual journey to find God, found at it’s center. The Trinity labyrinth design was conceived and installed with this spiritual purpose in mind. We love gardens with a purpose! To find out more about labyrinths and their history, click here. "One is nearer God's heart in a garden than anywhere else on earth..."
We spared some love for select landscape designs, from Jersey to Long Island. Enjoy! New bed foundation features: Chinese Fringe Tree, Heuchera, Ferns, Astilbe, Hostas, Liriope, Hydrangeas & Mondo Grass by Blossoming Beginnings. Landscape Design, Atlantic Beach, L.I. Client requested a view of sun loving perennials from her office. We created this gardenworthy view, Blossoming Beginnings. Not all Hostas look the same. New small garden shade bed by Blossoming Beginnings. Front Yard landscape installation in Atlantic Beach, L.I. NY by Blossoming Beginnings. Before pics of First Presbyterian, North Arlington, landscape design by Blossoming Beginnings. Landscape design install at First Presbyterian Church in North Arlington, NJ. Landscape Design Installation, First Presbyterian Church, North Arlington, NJ. We replaced turf with groundcover, installed custom planters with eco friendly paint, native perennials, flagstone circle & Patio Pavers by Blossoming Beginnings. Installing a paver area for homeowner, resident grillmaster. Ridgefield Park, Landscape Design by Blossoming Beginnings. Laying the flagstones in a circular design, interplanted with Creeping Thyme by Blossoming Beginnings. No chemicals were used in this project at client's request. Even the paint was eco friendly! Landscape maintenance and expert lawn remediation has made this New Milford client’s house standout.